At this year’s World’s Fair of Money in August, the official convention of the American Numismatic Association in Chicago, Stack’s Bowers Galleries will present the Harry W. Bass Jr. currency holdings showcasing the development of the popular "Educational Notes," a long time favorite among collectors. Harry was best known for his collection of rare and unique early gold coins from 1795-1834 by date, denomination and die variety. Along the way he also assembled important holdings of patterns, paper money, and more, ranking him as one of the most important collectors and scholars numismatics has ever known. The Bass offering consists of several dozen essays, proofs and other unissued denominations, all of extreme rarity and some even unique. 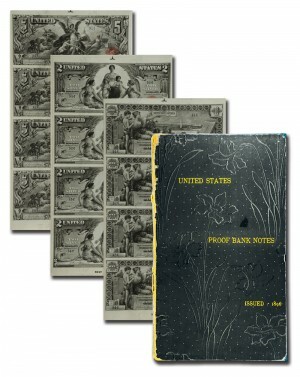 This series illustrates the development of the beautifully designed "Educational Notes" and culminates in an intricately bound set of three uncut sheets—with serially numbered notes 1, 2, 3, and 4 of the 1896 $1, $2 and $5 notes. Included are documents pedigreeing the set back to the time of issue. These important notes had been on display in the Harry W. Bass Jr. multimedia gallery at the ANA headquarters in Colorado Springs for several years. 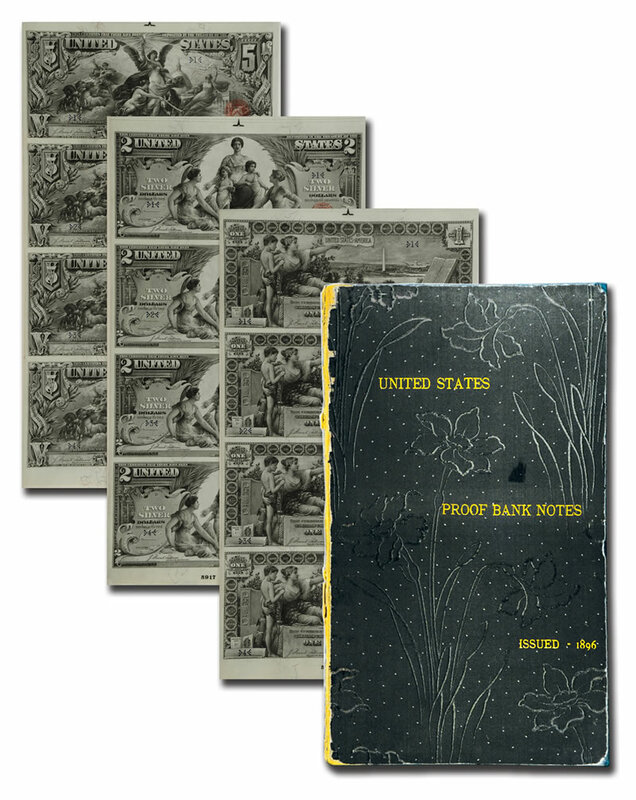 Q. David Bowers, chairman emeritus and author of The Whitman Encyclopedia of United States Paper Money, commented: "In my opinion this lot is the most important lot ever offered at auction in the entire history of collecting American paper money!" Indeed, the $1, $2 and $5 Silver Certificates of 1896 are generally recognized as the apex of artistry in United States currency. The opportunity to acquire the first sheets printed has never before occurred at auction, and may never again. "This set will automatically rank the buyer at the forefront of American paper money collectors," Bowers continued. "Indeed, these sheets would make a fantastic museum display all by themselves." "But that is not all," commented Chris Napolitano, president of Stack’s Bowers Galleries. "Hundreds of other important notes will be offered, including Gold Certificates, Treasury or Coin Notes, Legal Tender Notes, Federal Reserve Notes, and others, large and small. National Bank Notes will be a prime attraction as well, including a marvelous selection of $1 ‘aces,’ rare locations, a serial No. 1 $5 National Gold Bank of D.O. Mills & Co. note, and other highlights, plus a large selection of popular and affordable issues—literally something for everyone." "We will be producing a special separate catalog for the Harry W. Bass Jr. Collection Part V under the watchful eye of Q. David Bowers and our expert team, in addition to our spectacularly illustrated and authoritative regular catalog of important notes from all series. Certainly this event and the evening of August 17 will be long remembered in the world of currency collecting" stated Christine Karstedt, vice president. "The first four parts of the Bass Collection, sold by the firm beginning in 1999, have realized over $37 million, ranking the cabinet as one of the most valuable ever to cross the block." "We are thrilled to add our PMG expertise to the presentation of one of the most significant currency holdings of our time. Indeed, the certification experience will be always remembered by our staff. The Harry W. Bass Jr. Educational Series is unique and absolutely definitive—the first sheets printed of the three denominations plus essays and proofs, an incredible display the likes which has no equal in the field of American paper money. It has never been equaled by any auction presentation in numismatic history" stated Steve Eichenbaum, CEO of Paper Money Guaranty. For further information on participating in this sale or consigning to a future event, visit www.stacksbowers.com or contact Christine Karstedt at chrisk@stacksbowers.com. Stack’s Bowers Galleries, a division of Fortune 500 Company Spectrum Group International Inc., was launched in January 2011, combining the extraordinary histories of Stack’s, the oldest rare coin auction and retail company in America, with Bowers and Merena Auctions, one of the world’s pre-eminent auctioneers of rare coins and paper money. The two companies unite to share a combined legacy that spans more than 100 years, and includes the cataloging and sale of many of the most valuable collections to ever cross an auction block — the John. J. Ford, Jr. and Louis E. Eliasberg collections, the Harry W. Bass, Jr. Collection, and the Norweb Collection, to name just a few. Topping off this amazing numismatic history is the inclusion of the world record for the highest price ever realized at auction for a rare coin, the legendary 1933 St. Gaudens Double Eagle which realized an astounding $7.59 million (sold in partnership with Sotheby’s). The company is headquartered in Irvine, California, with offices in New York and New Hampshire. Stack’s Bowers Galleries is the Official Auctioneer for several important numismatic conventions, including the ANA World’s Fair of Money and ANA/PNG Pre-Show, and the Whitman Coin and Collectibles Expos in Baltimore, three times yearly, and Philadelphia.